Rahm on Running for Mayor: "No, I Won't"
White House Chief of Staff Rahm Emanuel is sometimes referred to as a potty mouth. 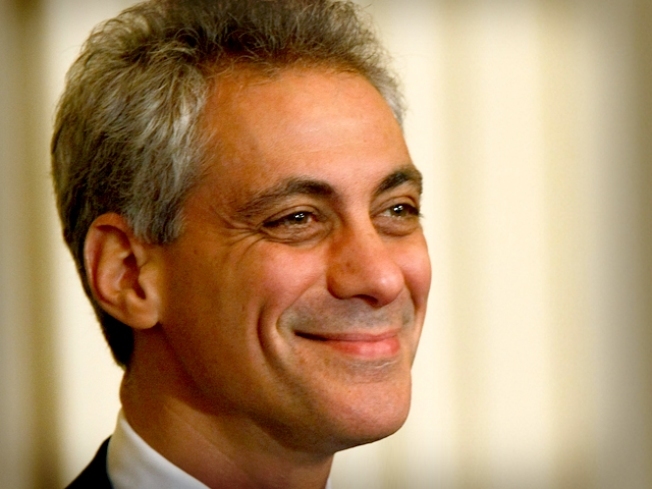 Rahm Emmanuel vowed today that he would not be running for mayor of Chicago. Asked directly whether he would run, Rahm said simply "No. No I won't." Asked directly whether he would stay as President Obama's chief of staff, Emmanuel said "Yes, I'm staying." Rumors about Emmanuel's jockeying for the mayoralty of Chicago began after Washington Post columnist Sally Quinn floated the idea last week, arguing that Rahm hadn't fired social secretary Desiree Rogers because he needed her for a run. Emmanuel made the comments while appearing as the first guest of MSNBC's new morning program, The Daily Rundown. Embellishing on his stance, Rahm delivered a four-point reason. "One, Rich Daley is a very, very dear friend of mine," he said. "Two, he's a great mayor of a great city," and three, "I hope he seeks re-election." Fourthly, Emmanuel said, he was "pleased to get offered to do this job" and he will do it as long as President Obama will have him. Emmanuel had said over the weekend that he wanted Mayor Daley to run again.